Hi! I’m Karina, as a fitness trainer, wellness coach, and a model my physical health and appearance is my livelihood. But more importantly, I know that fueling and nourishing my body from the inside out is going to help me achieve my overall fitness goals. That is why I am stoked about IdealLean Krill Oil! By now you have heard how important omega-3 fatty acids and fish oils are for your health and for your fit body—which is where IdealLean Krill Oil comes in. Better absorbed into your system than fish oil, krill oil will help you optimize your performance, healthy lifestyle, and nourish your body. With a mixture of fatty acids, you can get a boost in your mood, as well as reduced inflammation. 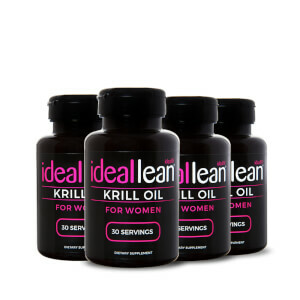 So check it out fit babes, and add in IdealLean Krill Oil into your daily supplement routine! With your boosted mood and your fueled and nourished body, you’ll feel like you can not only take on any workout, but you’ll take it on to the next level! 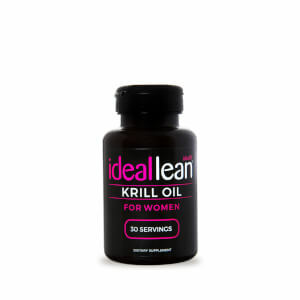 Why Should I Use IdealLean Krill Oil? When we think of adding fish oil into our diets, I bet none of us initially thinks of Krill Oil! While it may seem like a strange way to implement those healthy fatty acids high in EPA and DHA, (because, I mean whales eat krill don’t they??) Krill Oil has a higher bioavailability than fish oils, and is better absorbed metabolically. 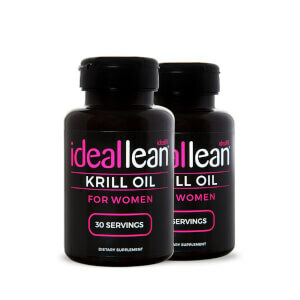 IdealLean Krill Oil is the perfect way to add in those omega 3-fatty acids that your body need! Krill Oil is made up of a mixture of fatty acids high in EPA and DHA in the form of phospholipids which contributes to cardiovascular health and helps to support healthy fat-burning. It can even alleviate some of the minor symptoms of PMS including fatigue, menstrual cramps, and boost that time-of-the-month mood. And because Krill Oil has less of a fishy aftertaste than fish oils, that means no nasty fish burps! And because IdealLean Krill Oil contains all-natural, pure krill oil, your body will be getting the support and nourishment it needs from the inside out from the omega 3-fatty acids! Can I view IdealLean Krill Oil's nutrition facts? How well is krill oil absorbed in the body? Krill oil is easily absorbed due to its phospholipid structure. Phospholipids comprise human cell walls, which makes krill oil recognizable to the body, contrary to fish oil. Fish oil is found in the triglyceride structure which your body has to break down through an enzymatic process. Is this product GMO free? While our product is not certified with a third-party certifying body like Non-GMO Project, the product is free of GMOs. No this product has not been certified kosher. This product has not been tested for gluten levels. How is krill oil different from fish oil? Krill oil may be a stronger, more effective way to get your daily omega-3s than fish oil. Krill oil is in phospholipid form, the type of lipid that human cell membranes are composed of. This allows for easy and immediate absorption into the body. Krill oil also contains astaxanthin, a potent antioxidant and carotenoid. Fish oil is generally in triglyceride form, which needs to then be converted to phospholipid form. Some of the beneficial qualities and strength of the fish oil may be diminished during this conversion. Krill oil is the better alternative to fish oil if you are looking for maximum potency, efficacy and purity in your omega-3 supplement. Krill are small, shrimp-like crustaceans. They are extremely pure because they are at the bottom of the food chain. Their high omega-3 content comes from their phytoplankton diet, which is naturally high in EPA and DHA. Krill oil’s EPA and DHA are pre-converted and in the highly absorbable phospholipid form. Krill are sourced from the waters of the Antarctic, a pure and uncontaminated body of water. Krill are naturally high in astaxanthin, a powerful antioxidant and carotenoid. Astaxanthin is what gives krill and krill oil its bright red/orange color. What is the best time of day to take krill oil? Krill oil can be taken at any time of day. To reduce any risk of digestive upset, take krill oil with a full meal. Some find that taking their krill oil at breakfast is convenient and easy to remember. As long as you are taking your recommended krill oil dosage per day, timing should not be an issue. Docosahexaenoic acid (DHA) is an omega-3 fatty acid that needs to be obtained from your diet, making it an essential fatty acid. DHA is required for brain and eye health. It is particularly important for children during their developmental years for proper brain and eye development. Krill oil is naturally high in DHA. DHA can be used to help manage hyperactive behavior, healthy mood, cardiovascular health, brain development in babies and children, feminine health and more. Eicosapentaenoic acid (EPA) is an omega-3 fatty acid that has been shown to promote cardiovascular health and a healthy inflammatory response. EPA is a natural component of krill oil and helps to support the maintenance of good health considering it is commonly lacking the diet. Are omega-3s good for heart health? Yes. The omega-3s found in krill oil are clinically proven to be beneficial to heart health. Krill oil has been shown in multiple studies to support healthy cholesterol levels. A study that was published in the Alternative Medicine Review, found that one to three grams of krill oil per day was significant in promoting arterial health. How should I store my krill oil? Store in a cool, dry place protected from heat and light. No refrigeration is required. We are sure you’ll love our product! If you don’t, send it back within 1 year for a full product price refund!